For IoT startups CES is one of the main events to present yourself to a larger and specialised audience. Triggi announced their name change during the first day and Frank Meeuwsen is happy to share his CES learnings. Over 170.000 visitors from 150 countries gather in Las Vegas in the first week of January for the CES convention. The world’s biggest tech convention has over 4000 exhibitors ranging from the big names like Samsung and Google who set up shop at the LVCC, the Las Vegas Convention Center. You can also find interesting views on future technology in the Sands Expo Convention Center near the Strip. Together with our team from Olisto we were there as one of the startups present at the Holland Tech Square or Holland Startup Pavilion during the CES. A great experience I can recommend any startup who wants to go global. But first, Olisto? What’s up with that? I thought you were named Triggi? On the first day of the CES, we announced our name change. Our smart home app Triggi will continue under the name Olisto. After two years of international growth, it is time to continue with a name that better fits our ambition to connect everything with everything. Back in 2016, we launched our service and an app that connects smart devices, digital services and your favorite apps, and have them work together following your rules. With our service, one device could trigger another for some action. We launched our app under the name Triggi, with a slight wink to tricky, tricking something into working for you. With this new phase, we say “Goodbye” to our name Triggi. Many felt that this name was somewhat technical or geeky, whilst we strive to simplify complicated technology and make it accessible to a large public. Our ambition goes beyond connecting smart devices. We would also like to connect digital services and have them work together. We feel that Olisto is a fresh and open name, that better suits our ambition to connect everything with everything. With that in mind, we were present at the CES 2018 as both Triggi and Olisto. Our booth was branded Triggi but we brought along some new Olisto stickers. The name change was a great conversation starter for us during the convention. And we learned some more! Last year, the Dutch startup scene was present with about 25 companies. During 2017, StartupDelta worked relentlessly to make sure the Holland Tech Square was double in size in 2018. They succeeded and it worked great. Because we were present as a group of startups all under the Dutch flag, this really benefited us all. In 2016 we were one of the many, many startups present at Collision Conference in New Orleans. We had to fight for attention because our booth would drown in the sameness of the other startup booths. 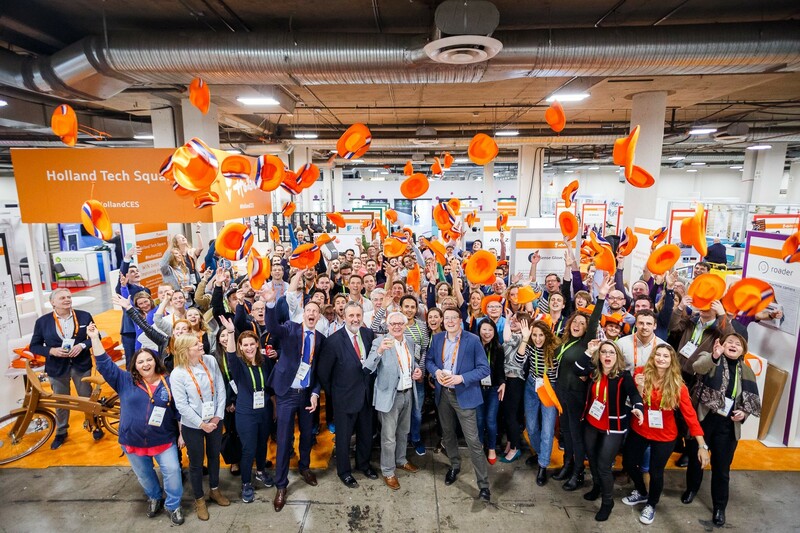 Of course, you have to fight for attention at the CES as well, but on the other hand people deliberately visit this big orange square that was our pavilion and really check out all the startups. The team from StartupDelta really went above and beyond to help all of us with introductions to media, investors and business partners. If you have the chance to be part of the StartupDelta ecosystem, do so and be an active participant. I have to be honest, this is where we lacked in our attention. The internal Slack group for the CES 2018 was very vibrant but we constantly forgot to check and post there. But also in preparation of the CES, we were so busy with other stuff (which of course every startup is!) we just didn’t have the possibilities front and center on how Startup Delta could help us. They did help us tremendously with contacts to investors and business partners, but there could have been more if we had a bit more focus on that. This one goes hand in hand with the startup alliance tip. When you are at the CES, get to know your neighbor startup! You will hear each other’s pitch hundreds of times and trust me, there will be a moment when you are too busy and your neighbor will help you out. We’ve had our neighbors quickly tell some interested visitors about Olisto and we helped out when they were at lunch or in a mediapitch. Here’s the thing, you can be one of many and show demos all day long. Whenever someone shows up, you demo your product and do your pitch. Or you can make them hungry. Mindaffect was one of the exhibitors and they have an incredible BCI (Brain Computer Interface) which let’s you control a computer interface with brain signals. The demo they had with them was a minimalist headset that lets you look at letters to type them. You have to see it to believe it. Which was exactly what they did. Everyday at 3 PM they would have one demo at their booth. People came back for this. They had live TV coverage. Because it was indeed something that had to be seen to believe. We had our goals very clear, we were there to introduce ourselves to new business partners who could integrate in our app. And we had some meetings with potential investors. With the help from StartupDelta and our own network we had a list of meetings and appointments. Your goal can be very different. For instance, the Somnox Sleep Robot had a goal to get more media coverage and they got it in a big way due to their meticulous planning and a nice stealth operation to get attention from journalists. Every startup has their own goals to get something out of a convention. Make sure everyone in the team is on the same page before you board the plane. “Always have a Plan B” is one of the tips every exhibitor on any event should have. Because things always go the other way than you might expect and you need to be alert on it. The fine team from Dutch startup We.Stream provided free WiFi access for our pavilion during the CES. They did an excellent job but unfortunately the WiFi wasn’t always working full speed. Especially at peak business hours. To demo the Olisto app, we need internet access and we quickly found out this can make or break your talk. So after day 1 we decided we need a plan B. We quickly made an offline design mockup with screenshots. During the day we added some other demo’s to the MVP version we already used. We iterated our demo as we went along and it worked great! Maybe we could build this before we went to the CES, but being on the spot and knowing what would work in a demo at the CES helped us decide really quick what got in it and what not. At Collision Conference 2016 we were one of the exhibiting startups. We decided to bringsome Dutch treats for the visitors, stroopwafels. These real Dutch syrup waffles were a big hit so we brought along 1500 pieces again this year. Yes it works. People are hungry at a convention like the CES and they are polite enough to listen to your pitch when you give them a free cookie. Yes. Do it now. CES 2019 will be from January 8th to 11th in Las Vegas. Make sure you book a hotel on walking distance from the Sands Convention Center. You will always have to wait in line for a taxi and the shuttle busses are too crowded to be in every day. Frank Meeuwsen is the Community Architect at Olisto. You can follow him on Twitter but you don’t have to.